Want to meet the up and coming leaders of North Carolina? Interested in showcasing your business, program, and/or materials? Are they related to NC FCCLA mission and goals, family studies, or the the multiple areas supported by the Family and Consumer Sciences curricula? 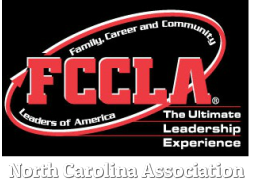 Join the NC FCCLA Executive Council and future leaders from around the state at the NC FCCLA State Leadership and Competitive Event Conference! ​Market your business and program to the best of NC! Please click below for more information on becoming an exhibitor at our next State Leadership Conference!